Firefighter Christian Garcia of Mexico puts out hot spots in an area burned by the Shovel Lake wildfire near Endako, B.C., on Aug. 16, 2018. The Shovel Lake wildfire is more than 680 square kilometres in size and is the largest of the more than 500 fires burning across the province. Of particular concern is the Nechako Plateau, a region roughly 600 kilometres north of Vancouver that includes the village of Burns Lake, which is already packed with so many evacuees from surrounding areas that newcomers are being sent to Prince George. 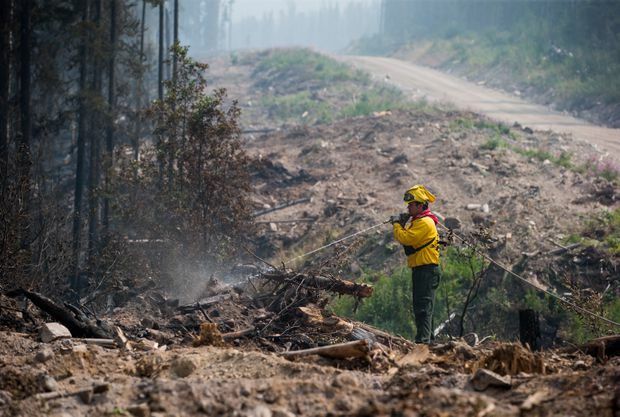 “If this increase in fire behaviour does occur, we can expect to see fires that spread quickly and burn aggressively,” Kyla Fraser of the BC Wildlife Service said an e-mail on Thursday. Ms. Fraser said thick smoke in the area was tempering fire behaviour, but that when the smoke clears and temperatures rise, as expected, the situation is expected to worsen. Bill Miller, chair of the Regional District of Bulkley-Nechako, said Burns Lake, a community of about 2,000 people, is near four major wildfires, although there is no evacuation alert or order for the village yet. “They’re big fires. They’re uncontrollable and they’re basically going where the wind takes them and, as I have understood from the weather people from [the wildfire service], we’re about to get a few days of pretty twisty winds,” Mr. Miller said in an interview from Burns Lake. “I’m a farmer and I never trust the weather report past three days, but the reality is that for the next three days, we’re in for a bit of a ride,” he said, noting the temperatures are increasing, the relative humidity is declining and winds are picking up − a scenario that encourages fires to spread. Mr. Miller said he was concerned about the impact of the fires on communities and infrastructure, such as highways, hydro lines and even fibre optics, in his region, as well as the reality that some residents will “stay and defend” their property rather than obeying evacuation orders. Bob Simpson, the mayor of Quesnel, said the fire situation was somewhat calmer midday Thursday compared with last week. “The Narcosli Creek fire, a week ago today, went from a nothing fire with no resources on it and it took a run straight toward the city of Quesnel,” he said. The BC Wildfire Service said that, as of Thursday morning, the Narcosli Creek fire was 70-per-cent contained. Mr. Simpson said the other fires in the area were a fair distance from the city, adding that thick smoke was the primary health hazard. Mr. Simpson said he is meeting with Premier John Horgan’s deputy minister later this month and plans to discuss ways to fight large wildfires before they begin, through measures such as prescribed burns. To date, the 2018 wildfires have consumed 435,650 hectares of forest, which means this season already ranks fourth in area affected since the first reliable measurements were taken in 1950. The most severe damage was last year, when 1.2 million hectares were burned, followed by fire seasons in 1958 and 1961, according to data from the wildfire service.